This is the thanks we get?!?! Just when we get through twisting ourselves into knots to explain, defend and justify our inclusion of a decidedly poppish hit record by Ivory Joe Hunter, rock’s most vexing artist, here comes Ivory Joe on the flip side to make us do it all over again. Not only that, but he’s not merely repeating his stylistic line-blurring with pop music on this one. No, that would be TOO easy. Then we’d just have to refer you back to the arguments made in the last review and reiterate it by saying that a lot of times in the future we’ll have big name rock stars crossing into more pop styled arrangements – Elvis Presley with Love Me Tender, The Beatles with Yesterday, James Brown with It’s A Man’s, Man’s, Man’s World, Stevie Wonder with My Cherie Amour and Michael Jackson with You Are Not Alone… and those are arguably the Top Five rock artists of all-time in terms of objective qualifications. So if Ivory Joe Hunter wants to skirt the edge of the pop universe a few times as well, who are we to say he’d have to be excluded entirely for those efforts in a rock discussion? Ahhh, if only it were that simple. With Hunter nothing ever is simple and here it’s not pop music with its elegant strings and muted trumpets that threaten to infringe on the more romping, stomping forms of rock ‘n’ roll that are dominating the release rolls in the spring of 1949, instead it’s the introduction of country music of all things to the rock formula. Are you saying that country music WILL play an increasingly notable factor in shaping rock down the road? Are you sure? You’re telling me that the country elements will become glaringly obvious in the form of rockabilly in the mid-1950’s and with the country-soul excursions of the early 1960’s? That artists as wide ranging as Bill Haley, The Everly Brothers, Ray Charles, The Rolling Stones and The Pointer Sisters will either come out of, or delve into country music in the foreseeable future? Huh, what was that? You claim that by the late 1960’s acts like The Byrds will jump wholeheartedly into country music right down to the garish clothing while still maintaining their rock allegiance? Really?!?! No joke??? You’re actually serious?! Well then, by all means, Ivory Joe Hunter you’ve done it again. How impudent of us for even considering showing you to the door when all along we should’ve been celebrating you for beating everybody to the punch in ways history still haven’t given you proper credit for. Okay, first thing’s first, just to get this out of the way: rock ‘n’ roll wasn’t created by mixing blues with country. That canard has existed for too long and as we’re now a year and a half into rock, more than 260 rock songs covered to date, and this is the first encounter with anything even remotely connected with country music, in a roundabout way no less, that should be enough to set the record straight. Furthermore over the next few years there won’t be many other rock records with even a trace of country music in their DNA. But that’s not to say that once it did get dragged into the mix it didn’t add an interesting component that further expanded rock’s boundaries. As with anything it’s not the source something is drawn from that matters as much as how it’s adapted to be used in a rock setting. Even the trumpets we rail about here for sounding so ill-fitting eventually figure this out and adjust their playing to assimilate. Since this is our first brush with anything country related it probably will help to focus on just what the country music market was in the late 1940’s to help us get our bearings. In fact country music was still widely referred to as folk music and even hillbilly, terms that were as much for distributors and retailers as anything (remember, all black music, regardless of style, was listed under “Race Records” still!). But regardless of the terminology being used what we’re concerned with is the musical approach, and country music, or folk or hillbilly, primarily featured stringed instruments (almost always including prominent steel guitar and fiddle) which was far removed from the rock market, not to mention the jazz market, which assiduously avoided those instruments* and were largely brass oriented, something country music stayed away from entirely. That’s the most obvious difference, though of course there’s other factors as well primarily found in lyrical perspectives, settings and life experiences, plus the natural differences in vocal shadings of the respective singers and the vocal techniques used to emphasize or accentuate their cultural image in relation to their audience. Of course the best way to understand it is simply to hear the songs that were popular at the time in country music. Eddy Arnold had held the number one spot on those charts for a full year, as we discussed back in August 1948, and in 1949 he was still the most popular singer in the field but was joined at the top of the charts by the likes of Jimmy Wakeley (among the last of the singing cowboys, a popular image which helped to idealize the country singer role), Red Foley, who had a country boogie feel, and for the first time Hank Williams with his plaintive yodeling highlighting his delivery. Their keening voices often emphasizing a high tenor whine backed by the steel guitar that had a similar tone and accented by fiddles which provided rhythmic variations were the dominant sound of the country and western style. One listen to Ivory Joe Hunter’s mellow baritone a top his typical piano and horn led arrangements and you’d say he couldn’t possibly belong here. Normally you’d be right. But Hunter had a lifelong interest in country music and while it’s a stereotype to say that country music tended to put more focus on the lyrical side of the equation while rock (and blues and jazz for that matter) were more centered on the musical elements, Hunter was always a particularly keen eyed lyricist and so maybe that’s the aspect which drew him to the country idiom. Regardless of the whys though, the resulting collision of styles here doesn’t quite turn into the disaster it could’ve been and in fact That’s The Gal For Me is actually one of his more enjoyable tunes to date, lighthearted and effervescent in a way he sometimes had trouble pulling off. Earlier in the review we included an asterisk next to the line about rock and jazz avoiding steel guitars and fiddles. Actually jazz didn’t avoid the fiddle, they just called them violins. The difference between the two is in semantics. It’s the same instrument but it’s played differently depending on the term, primarily because those playing it are adhering to the needs of the style of music. 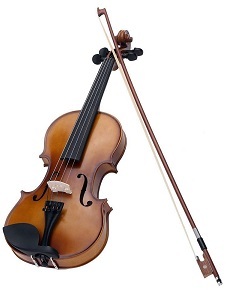 Those who call it a violin put the emphasis on melody and with its high pitch the sound stands out, making it a centerpiece of chamber music in the classical realm while used as more of a melodic accent in jazz. Fiddlers however, drawing from working class origins dating back to the Scottish and which spread through rural Appalachia and then westward in America, play it as a rhythmic instrument whose purpose is to get listeners dancing. 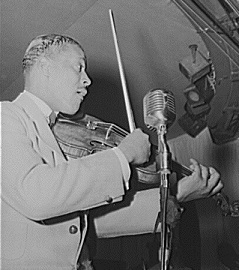 These musicians are renowned for playing fast and while generally not as technically skilled as their classical counterparts they perform with more flash and as such they have the featured role in square dances and at one point it was the fiddle more than the guitar which provided the accompaniment to blues. By 1949 the violin was largely seen as a “sweetener” for pop songs, something to make them sound classy and ornate, which is one reason why Hunter’s Waiting In Vain appears at a glance to skirt the edge of pop music rather than fully settling within the rock genre. On the flip side, That’s The Gal For Me the instrument is just as prominent but altogether different, even though Ray Nance handled the chores on each. Here Nance is using it as a fiddle, giving the song its rhythmic thrust and in the process adding a very distinct country music feel to it. Harold Baker’s trumpet still kicks this off, something you wouldn’t hear on a country record, but then Nance jumps in and is quickly joined by the other band members – presumably the horn players who sit most of this out – clapping in time. The drums and Hunter’s piano add to the deliberately choppy feel even though they’re largely keeping in the background, and the entire track is riding a pretty catchy groove, lifting the spirits of the listeners – even those who normally wouldn’t be drawn to the far-flung individual elements – and the infectious spirit they deliver is what Ivory Joe’s upbeat vocals latch on to. The storyline is the complete opposite of what we heard on the A-side. Whereas that Hunter was despondent about an unfulfilled love, this Hunter is eagerly anticipating hooking up with the girl in question. The lyrics are essentially him grilling his buddies about this woman – you’d assume it’s a blind date by the sound of it – and while he’s got some pretty specific tastes regarding her attributes he seems easily swayed by their answers. When the horns return for the break the fiddle drops out, yet rather than come across as schizophrenic as you’d imagine, the handclaps act as the bridge to link the two disparate sounds. The pause that happens as the horns start up signifies it’s now Nance who’s taking that role but it’s carried off seamlessly. By now you’re caught up in the ebullient mood they’ve created and so no matter how incongruous this whole arrangement seems on paper you barely notice that the parts don’t usually go together. King Records was a fitting label for this unlikely meeting of divergent styles as the company had solid credentials in both fields. They’d began as a country label in 1943 and soon added black artists, first in big band derived jazz, then some blues (uptown and country blues variety, as opposed to urban Delta derived) and finally rock took over as their primary pursuit on that side of the ledger. But the label would go on to do more than any other to bring white and black styles together, often by merely looking to double their publishing income by having their country acts cut songs that first were done by their black roster, or vice versa, in the process bringing out elements in the tunes that may never have been explored had they remained in the idiom they began in. This isn’t one of those examples, but it is just as notable for the melding of two distinct sounds that seem at odds with one another, and yet thanks to the band’s tight playing and clever arrangement and Hunter’s evident vocal charms they wind up carrying it off. Don’t get me wrong, That’s The Gal For Me wasn’t going to set the music world on fire. Rock fans were sure to find it a bit strange and country audiences would likely never hear it as Hunter wasn’t going to be stocked in the jukeboxes catering to that crowd, but what it showed was the possibility of bridging the gap in an artistically satisfying way was there to explore further should anyone care to tackle it. But in the process it also showed that Ivory Joe Hunter, someone we reluctantly criticized in the past for never going far enough in any direction to escape a charge of being somewhat bland, has – on both sides of this release – shed that tentative approach and was flexing his creative muscles. While neither song would seem on the surface to be radical, especially when compared to the noisy rockers we’ve praised to the heavens in the past year or so around here, the truth is these songs contained elements that were radical simply for the lines of demarcation both songs intentionally crossed. You might not say that Hunter is stepping into the lead of the rock parade with material like this, efforts like these were never going to define rock that’s for sure, but he’s definitely showing the experimental flair that would long be one of rock’s most celebrated hallmarks and for that alone both of these sides are entirely welcome on the scene. Leave a reply on "Ivory Joe Hunter: “That’s The Gal For Me”"